Activity levels of dopamine neurons involved in a reward pathway may provide an advance signature indicating which individuals are most likely to develop depression in response to significant life stress. Chronic stress can cause some people to become depressed, potentially through stress-induced changes to certain neurons in reward-related regions in the brain such as the nucleus accumbens. But it has been difficult to determine whether susceptibility to the effects of stress are pre-existing in these neurons, or if repeated stress creates this susceptibility. Now, a team of researchers reports in the journal Neuropsychopharmacology that the activity in at least one type of neuron predicts whether socially stressed mice will develop depression-like symptoms, prior to that stress. This predictive activity signature could be used in the future to identify people at greater risk for developing depression after significant life stress, and may point to future drug targets to treat stress-induced depression. The team used a fiber optic-based technology to observe the activity of two types of cells in the brain’s nucleus accumbens—called D1 and D2 medium spiny neurons—that are known to be involved in depression-like behavior in mice, following their exposure to stress. The technique allowed the researchers to measure the activity of these neurons before and after social stresses in awake and normally behaving mice. They determined that the mice most likely to be resilient against depression-like symptoms have a higher level of activity in the D1 neurons prior to experiencing stress—while those mice with preexisting lower levels of D1 neuron activity were more susceptible to developing depression-like symptoms. The data “highlight that preexisting reward circuit dysfunction is a crucial mediator of depression vulnerability,” the researchers conclude. 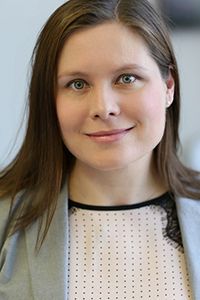 Rosemary Bagot, Ph.D., a 2014 Young Investigator at McGill University and the Ludmer Centre for Neuroinformatics and Mental Health, was the study’s senior author. The team also included first author Jesse Muir of McGill University; Stanford University researcher Karl Deisseroth, M.D., Ph.D., a Foundation Scientific Council Member, 2013 Goldman-Rakic Prizewinner and 2005 Young Investigator; Icahn School of Medicine at Mount Sinai researchers Eric J. Nestler, M.D., Ph.D., a Scientific Council Member, 2009 Falcone Prizewinner, 2008 Goldman-Rakic Prizewinner, and 1996 Distinguished Investigator; and Erin S. Calipari, Ph.D., a 2016 Young Investigator.